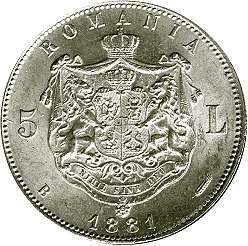 denomination "5 L", ROMANIA, year 1881, Romanian coat of arms, letter B and wheat ear, the signs of Romanian mint, outer pearl circle inscription "CAROL I REGE AL ROMANIEI" meaning "KING OF ROMANIA" and CAROL I head facing left, outer pearl circle. Under the neck lies KULLRICH, the engraver's name. 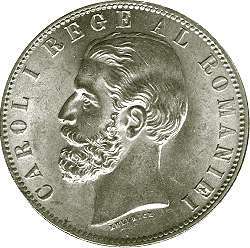 The silver coin pictures above are present on Romanian coins through the kind permission of Mr. J. M.. 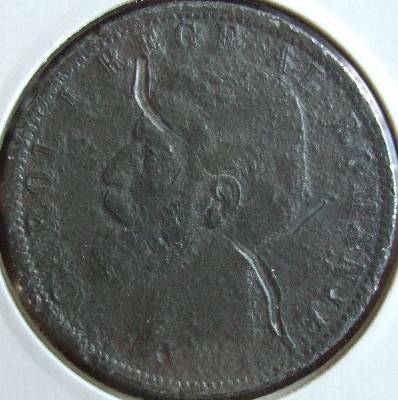 The 5 lei coin struck after the proclamation of the kingdom in 1881 has two variants. 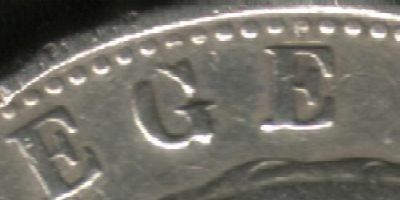 The one known as the thin G variant has a different set of letters, all thiner then the leters on the other variant, but the difference is obvious just for the letter G. It is also slightly rarer. Below is displayed a detail of a five lei piece from 1881 featuring the G in REGE broken. It may be a matrix flaw (most probably) or even a new variant. 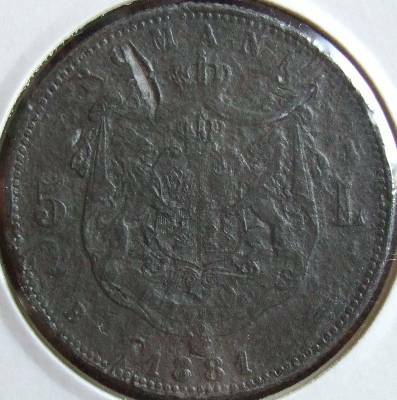 Below are pictures of a fake 5 lei 1881, that copy the thin G variant. The pictures were sent to us by Mr. C.P. (thanks!). The fake has 37 mm in diameter and is possibly made from zinc.